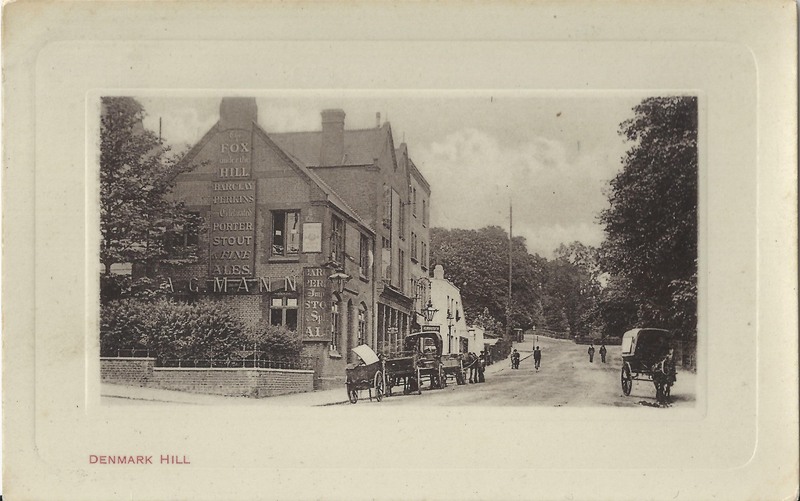 Like many of us, I have spent some time over the years in The Fox On The Hill towards the top end of Denmark Hill in the area known as the Triangle. Well it was not the original Pub. 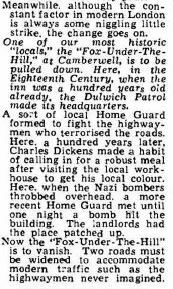 That was the Fox Under The Hill, which was located at the corner of Denmark Hill and Champion Park. Postcard published by Albert Flint & Co,Nr 686. Postmarked Aug 26 1905, Here is the view from today. Photograph taken by Nick Stevens, April 2015. Postcard view published by Stengel & Co, undated but certainly around the same year as the Flint postcard above, 1905. And here looking down the Hill northwards. Published by Albert Flint, No 500. Postmarked April 7, 1905. Postcard no publisher and undated. 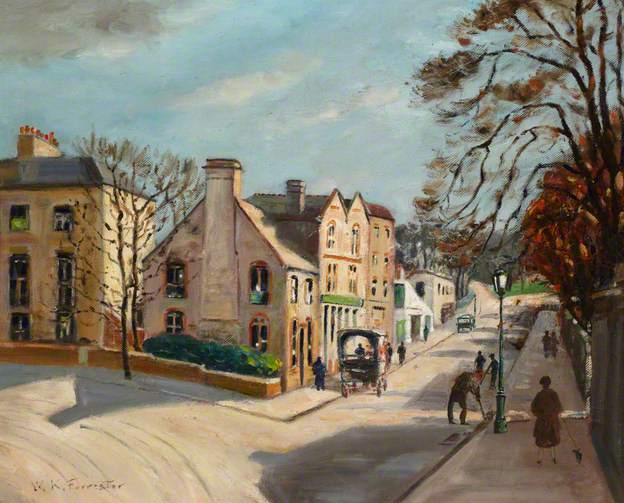 William Keddie Forrester was a prolific painter with many works featuring scenes in Southwark. The Fox Under The Hill dates from the 18th century. 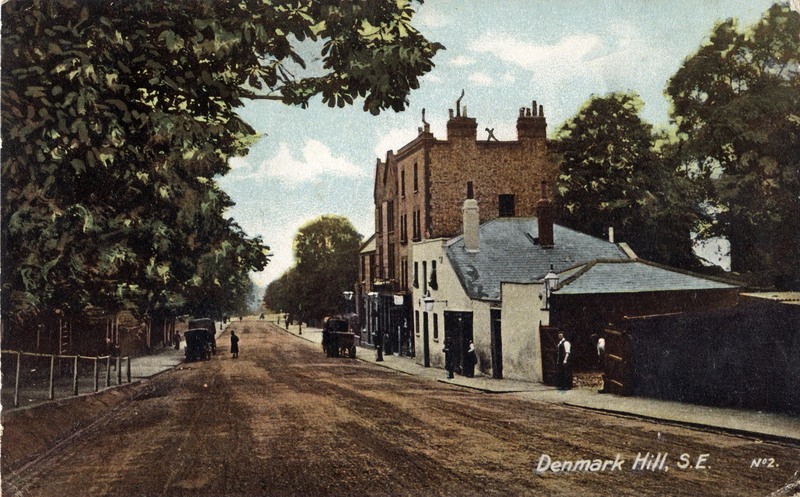 At that time it was known as Little Denmark Halls most likely named after Denmark Hall built in 1768 by Luke Lightfoot at top of the Triangle at the junction of Denmark Hill and Champion Hill as a major new centre of entertainment for Londoners. It was not successful and while the tearooms remained for a while the raminder were converted into houses. Another theory mentioned regarding the name is the obvious one, it’s connection with fox-hunting and The Old Surrey fox hounds were kennelled nearby for a time. Dog Kennel Hill springs to mind. Here the Fox Under the Hill is mentioned in a map drawn by Middleton Bailey in 1808, taken from A Perambulation of the Parish of Lambeth, held by Lambeth Landmark @ Minet Library. … the erection of a new watch-house, rendered necessary by the almost daily annd nightly burglaries and robberies which occurred in the district. Directly opposite the Tavern and Cage were some cottages wherin lived footpads and other bad characters. Unprotected people, setting out over the hill towards Dulwich after leaving the coach, would be noted from sone vantage point, and a little later there would be another robbery, sometimes with violence. 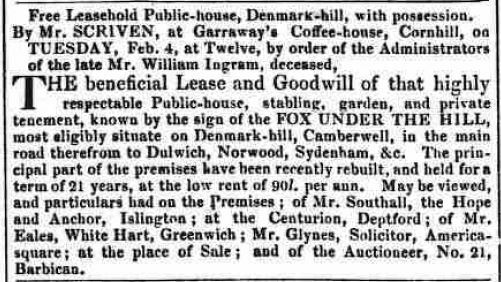 The Fox was advertised for sale in the following advertisment placed in the Morning Advertiser 1st February 1834. The Fox Under The Hill was certainly known as that in 1839 when John Saunders was registered in Pigot’s Directory as Landlord. Mentioned in an early Hone’s Year-Book according to The Survey of London, it being “the Sunday resort of many town-immured beings”. It also talks about the original Fox Under The Hill as a converted farmhouse of around 1680 to 1700 obviously having being rebuilt maybe once or twice. We know that it was rebuilt in 1874 as recorded by Blanch. In 1861, Charles Dickens published Great Expectations and The Fox Under The Hill is said to be the setting for Wemmicks Wedding breakfast. Wemmick and the Aged did live in Walworth. … and the tavern where Wemmick’s wedding-breakfast was held. 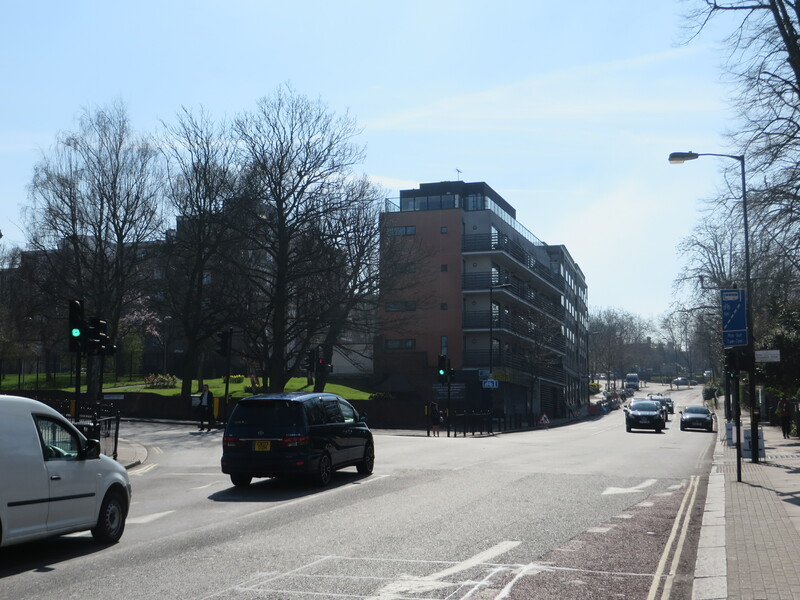 This is said to be the Fox under the Hill, nearly at the top of Denmark Hill. It is now a modern public-house, but sixty or seventy years ago it was an old wayside inn—a pleasant little tavern, and a favourite resort, especially on Sunday evenings in the summer, for the youthful population of Walworth and Camberwell. Extract from Dickensian Inns and Taverns by BW Matz. However to be fair there was another Fox Under The Hill just off the Strand and others suggest this was a more favoured venue, as it was an area Dickens knew well. 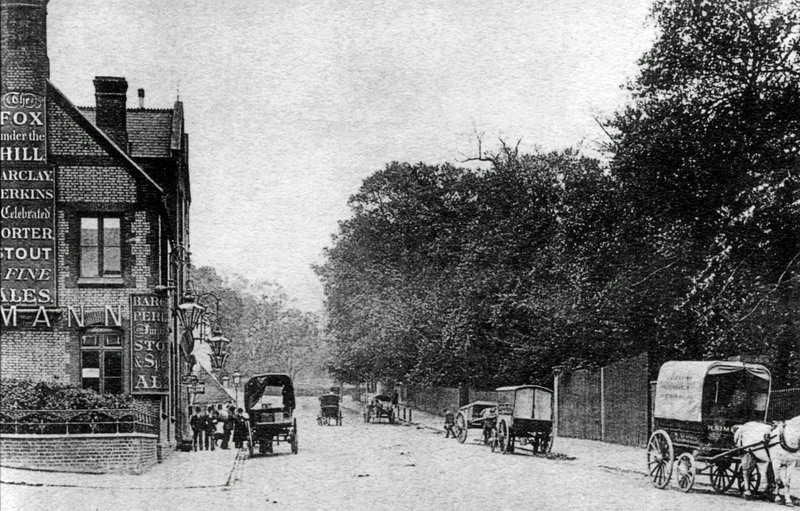 A photo postcard dated c 1910 showing the Fox Stables at 123 Denmark Hill. You can see alternate views of the stbales taken from further south in the earlier postcards above. Here is a photo newly released, taken on behalf of Charrington Brewery during an architectural survey of their pubs and recently made available by the National Brewery Heritage Trust. The photo is undated but is listed as between 1925-1955. The Fox Under the Hill was damaged in the WW11 blitz, the bomb falling slightly further up the Hill just behind the Pub. Written by Conrad Frost on 17th January 1953 and published in his column in the Aberdeen Evening Express. …finally in 1959 having reached an agreement the Fox On The Hill finally opened for business. The Survey of London, Volume 26, Lambeth: Southern Area , edited by FHW Sheppard and published by London County Council, 1956. 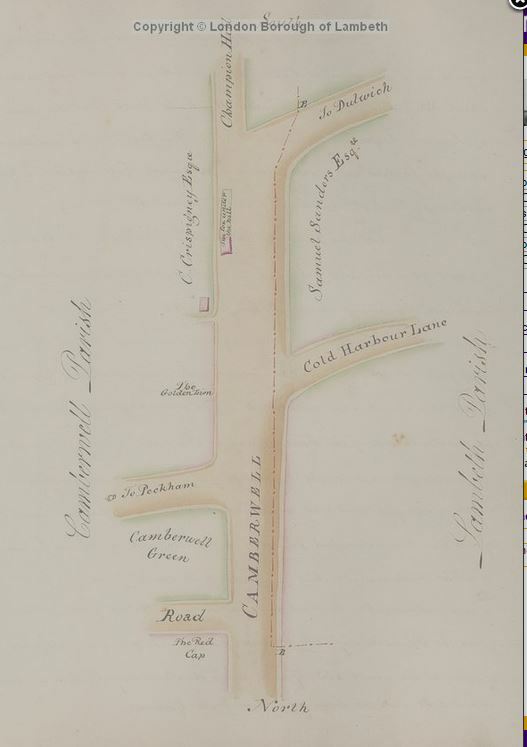 Ye Parish of Camberwell, William Hartnett Blanch, Published by EW Allen 1875. 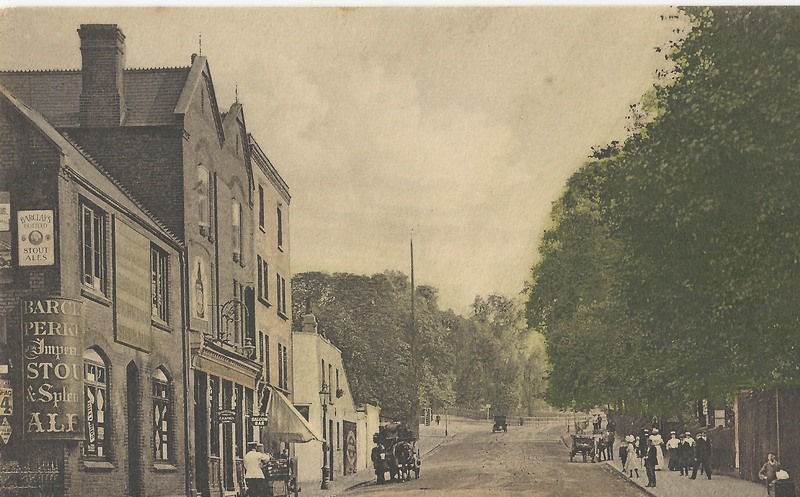 This entry was posted in Denmark Hill, Pubs and tagged Denmark Hill, Fox Under the Hill, Pub. Bookmark the permalink.